I've been a busy, busy mama. So busy, in fact, I've fallen into the rut of being a lazy mama when it comes to dinner. Pasta. Sauce. Repeat. Mr. Wright was working late, Pepper and GirlWonder were out of town with Princess, Pockets was with his other parents, and The Dude was at a wrestling tournament, so it was just me, Curlytop and Snugglebug for dinner last night. I wanted to make something with fresh vegetables, but I wanted something sweet and happy for the little ones, so I threw together this dish, which pleased my girls' palates and got some nutrition into their rapidly-growing bodies. If you're not experienced at stir-frying, there are some good tips here. Heat oil over medium heat. Add flour, stirring until flour is slightly toasted and no longer raw. Add garlic, ginger and cane juice crystals or sugar, mixing into a paste. Pour in orange juice and slowly increase heat while stirring, until almost boiling. The sauce should just begin to thicken slightly. Add soy milk and continue stirring, gently increasing heat until sauce begins to bubble and thicken. Pour immediately over vegetables. 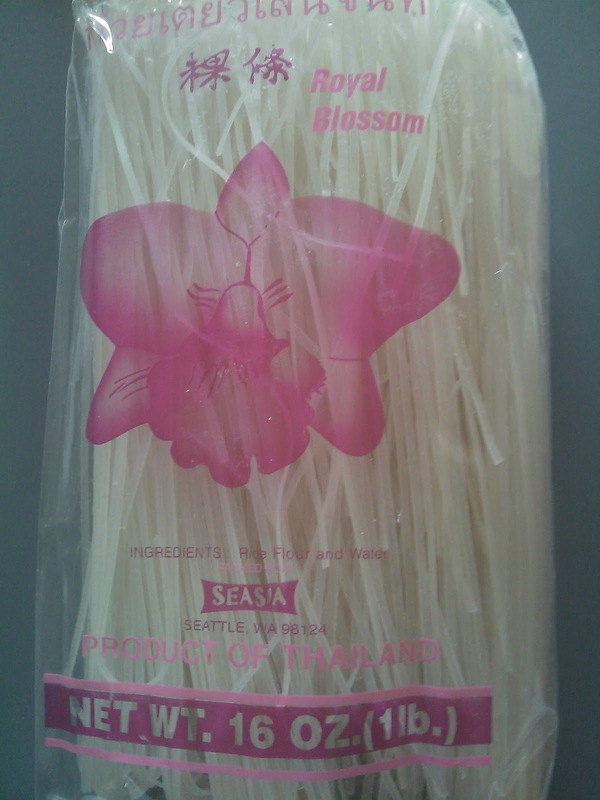 Rice noodles are very quick-cooking. The ones I get (below) are in 16-ounce packages, though even for my brood, I usually only use half a package at a time. Boil your water and add a splash of olive or canola oil, which will help prevent the noodles from sticking. They're very starchy and sticky, those rice noodles. When your water is boiling, toss the noodles in and cook for just a very few minutes until they're tender - three to five. Don't overcook the noodles! If you do, you'll be left with a soggy mass of starch and you will cry. Yes, you will. Drain the noodles when they're done. Serve the stir-fry and sauce over the cooked rice noodles, adding a sprinkling of slivered almonds, if desired. Thank you for this review about Recipe for Stir Fry Sauce! I'm trying to cook this for my family and I'm sure they will like this dish. This is perfect foods for a better occasion. I think your blog is perfect for me because it is easy to cook and healthy. I will cook this later. Thank you for sharing!